I've never really been fan of live albums, mostly because everything sounds like crap, with few exceptions. 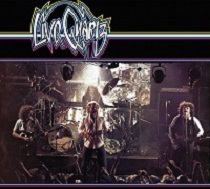 The sound of “Live Quartz” is not the best, but it actually lets you hear what the band was like live in the late 1970's. Everything sounds like it's live mic'd, including the bass which is fine because those amps in that era sounded great when loud and live. Mick Taylor isn't some booth diva and can belt it out. His interaction with the audience is enthralling and heartfelt, his "oh yeas" and "who's" properly placed and help move the solo's along beautifully, as heard in "Roll Over Beethoven"
An advantage for someone like me is live albums allow me to hear if an album I like was studio magic or true of the bands musical abilities, and after hearing both live and studio versions of "Street Fighting Lady" and "Mainline Rider" I am impressed. In fact, the live versions seemed free, unencumbered by the pressure of being in the studio, just a bunch of guys having a great time playing hard rock. Dek Arnold is on point, running his rig at max and playing the hell outta that bass. Mick Hopkins has a beautiful stage sound and it turns out, is a masterful guitar player. "Nantucket Sleighride" (what it was called when whalers harpooned a whale and were towed around by the rope in their rowboat till the poor creature died) showcased Geoff Nicholls keyboard skills. The problem I can't seem to get around though is the inconsistent tempo of drummer Mel Cope. If you don't use a click track live (even Neill Peart would use one on occasion) this might happen, especially if you have a lot of time changes and drum fills. Overlooking that though, he is a good drummer live and his speeding up was only noticeable on a few songs. As live albums go, this was enjoyable. I still prefer the studio songs but the CD really express's the talent and love of their music this band has. I wish I could have seen this line up live, it could have been a great experience.